This ThingPark Market Buyer Agreement (this "Agreement") is between ThingPark Market ("ThingPark") and you (if registering as an individual) (“You”) or the entity that you represent (if you are registering as a business (“Buyer”) Before clicking to agree to this Agreement, please read carefully the terms and conditions below. This Agreement does not have to be signed in order to be binding. You indicate your assent to the terms of this Agreement by checking the box (or similar action) to accept the Agreement that is presented to you. By clicking below to enter this ThingPark Market Buyer Agreement, you also reaffirm your agreement to abide by the Marketplace Guidelines. 2.6 “Wholesale Buyers” are defined by Buyers that comply with eligibility criteria as defined by ThingPark Market. The Wholesale buyers may be entitled to special prices. When you make a purchase through the Marketplace, you pay the Seller through your My Account using a valid credit card issued to you or wire transfer or any other mean of payment. If using a credit card, Your credit card will be authorized for the entire order amount immediately upon your placement of the order, and will be charged immediately.. You hereby authorize ThingPark to charge your credit card accounts for any amount that you may owe ThingPark or the Seller. In addition, ThingPark may also set off any amounts that you owe to ThingPark or the Seller against any amounts owed to you by ThingPark or the Seller. IN FACILITATING YOUR PAYMENT TO THE SELLER, THINGPARK DOES NOT PROVIDE YOUR CREDIT CARD INFORMATION TO THE SELLER. Once You have placed an order for a product in the Marketplace, Seller will be handling all aspects of the order process. ThingPark will not change or cancel any order made by you, including any change to shipping or billing information. You will need to contact the Seller for any changes or cancellations that you wish to make to your order. The seller’s contact information can be found in your order detail located in your “My Account” or in the email we sent to you confirming your order. 8.3. Buyers Data and Privacy‐Related Obligations. 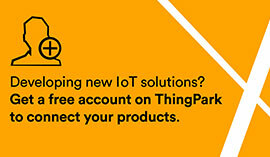 In addition to sales data related to Paid-via-ThingPark Products, if necessary, You acknowledge, consent and agree that ThingPark will provide the Seller with access to information that is reasonably necessary for Sellers to ship the Products to You and to communicate with You regarding such shipment and any issues that may arise in connection with your Purchase. This information includes but is not limited to your “ship to” information and Your name, company name (if any), physical or email addresses, and phone numbers ("ThingPark-Collected Buyer Data"). Based on the activities under this Agreement, subject to the provisions of this Section 8.4, Seller may also collect other information or data from You, some of which may include personally identifiable information ("Seller-Collected Buyer Data"). Any Buyers data or information, whether ThingPark-Collected Buyers Data or Seller-Collected Buyer Data, is, collectively "Buyers Data". For all Your Data Seller will (i) use and authorize others to access and use the Buyer Data only for the purposes of providing and improving the functionality and user experience of their Marketplace Product, marketing Seller Marketplace Products to Buyers or such other purposes You would have expressly permitted (in each case, in compliance with all Laws), and not modify any Buyer Data in a manner that adversely affects it integrity, and (ii) treat, store, transmit, disclose and use the information only in accordance with applicable privacy notices and laws, rules, regulations, orders, and other requirements of governmental agencies (together, "Laws"). Without limiting the foregoing and with respect to Seller-Collected Buyer Data, Seller shall provide legally adequate privacy notices You and You will be required to obtain all necessary consents under Law and (y) You will be notified that ThingPark is not responsible for the privacy, security or integrity of Seller-Collected Buyer Data. You are aware that Seller shall also maintain and handle all of Your Data in accordance with privacy and security measures reasonably adequate to preserve its confidentiality and security and all applicable Laws. For the sake of clarity, ThingPark shall not be liable for or have any responsibility in connection with Seller-Collected Buyer Data You hereby agree that ThingPark shall have no responsibility, obligation or liability with respect to the disclosure of such information to, or any collection, use or disclosure of such information by any Seller.